Fed up with the World Cup? Here at Cashbacker Towers, we're certainly not. If you're suffering from football fatigue or are relishing every second, Mecca bingo have a promotion to suit. With Gold Rush Striker, you can play every day of the tournament, so it's perfect for those for whom it's become a drag. If you're still enjoying it and want to combine your love of football and bingo, then the England Escalator Jackpots promotion is ideal. Ready For The Team Talk? The World Cup Final is on July 15. Each night until July 14, there's over £3,000 of networked prize cash available throughout this promotion. 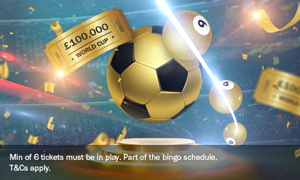 For the duration of the whole tournament, that adds up to a huge £100,000 prize pot. What's more, there's even an added everyone wins guarantee. We think we might need a half-time shower, as there's almost too many amazing bingo deals around. We think you can handle it though. The everyone wins guarantee means that every player with more than 6 tickets in play but who doesn't win a prize will still get a cash share anyway. It's a shame an equal good fortune can't be given to those teams who have already had to leave the World Cup. On 15 July, the night of the final (Come On England), there's £7,000 total winnings available. A single line increases to £500, 2 lines pay out £1,000 and a full house results in £1,500 (Come On Mecca Bingo). Head over to Mecca bingo to try your luck, but remember, there's no extra-time in this promotion. A £5,000 escalator jackpot takes place every day England play. The promotion is 1x escalator jackpot in the Gold Rush bingo room. Every hour, the ball call count willl increase by 2 until it is won. This is a community jackpot: 50% of the prize goes to the full house winner. The remaining 50% is allocated between all players in the room.